At the Wednesday Brown Bag Lunch Program join Friends of the Main Library in welcoming Don Wiles, discussing one of the largest maritime disasters in American history, The Sinking of The Sultana. In the early morning hours of April 27, 1885, the SS Sultana exploded on the Mississippi River. Many of the 2,000 passengers on board, including 1,100 Union solders recently released from military prisons, were killed. 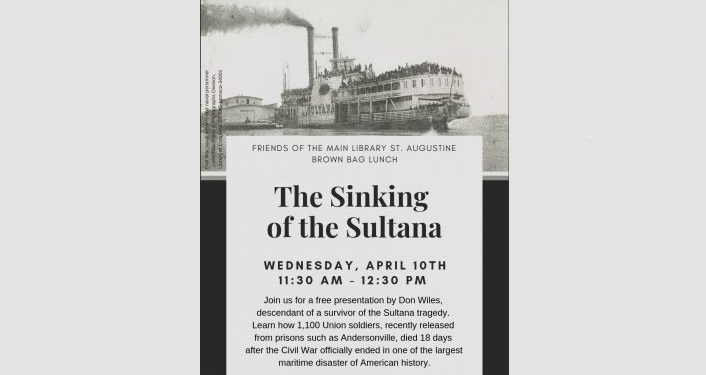 Friends member Don Wiles, a descendant of a survivor of the Sultana tragedy, will discuss how one of the largest maritime disasters in American history occurred 18 days after the Civil War officially ended. The presentation includes speculation about how the explosion happened, Army corruption, greed, conspiracy theories, rescue efforts, the will to survive, and the public’s response (or lack thereof) in this American tragedy. Don Wiles, an illustrator for over 60 years, worked at the Kennedy Space Center during the Gemini, Apollo and Skylab programs. He also worked for several advertising agencies and industrial companies. His interest in the Civil War started when he was 9 years old and he has done several presentations regarding the subject. This program is free and open to the public. Limited seating begins at 11:00 am and the presentation starts at 11:30 am. Light refreshments will be provided by Friends of the Main Library St. Augustine. For additional information, please call the Main Library at 904-827-6940.